Bobby Bauer was inducted into the NHL Hockey Hall of Fame in 1966, the second of hockey’s famous “Kraut line” to be enshrined. Bauer played with the Reds during the trio’s first American League season together in 1936. 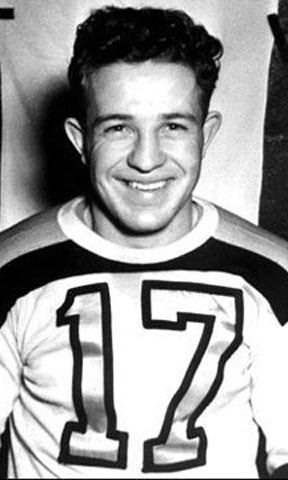 He scored 22 points with 14 goals in 44 games that season with Providence, the most points of any member of the trio, which were initially called the "Sauerkrauts" by Reds’ coach Albert Leduc. A member of two Boston Stanley Cup winning teams in 1938 and 1940, this right-winger had 260 points and 123 goals during his nine NHL seasons spanning 1936 to 1953. Together with Milt Schmidt and Woody Dumart, they became the first line to finish first, second and third in NHL scoring in 1939–40. The trio’s records would have been even more impressive had they not missed 2 ½ seasons fighting for their country during WWII. After their playing days, Bauer and Dumart partnered in a stick manufacturing company, which still bears Bauer’s famous name.